Welcome to this special page featuring highlights from my trip to Japan with Friendship Force International in 1990. Images here were scanned from the original 35mm negatives. Click any picture to enlarge, and enjoy! A traditional garden on the grounds of a branch of a small art museum near Matsuyama, Ehime Prefecture. My visit seemed to coincide with a string of drizzly, overcast days, but that didn't detract from the beauty of the gardens. The steep, stone steps leading to Isaniwa Shrine in Matsuyama. Climbing the steps is not obligatory; Less penitent sightseers can drive up an access road around the side, and park right next to the shrine. Then there were the steps behind Isaniwa Shrine, which I saw disappearing up a thickly wooded hill. My day host, Mrs. Matsuba, is smiling because after climbing them all to see what mysteries could be hidden at the top, our "discovery" turned out to be nothing but an electrical power substation. The O-torii of the Itsukushima Shrine, at low tide. From the look of it in this picture versus others I've seen, the torii was just about due for a fresh coat of paint. Still a very impressive sight all the same. A short ferry ride from Itsukushima took us to Hiroshima, and the A-Bomb Dome. 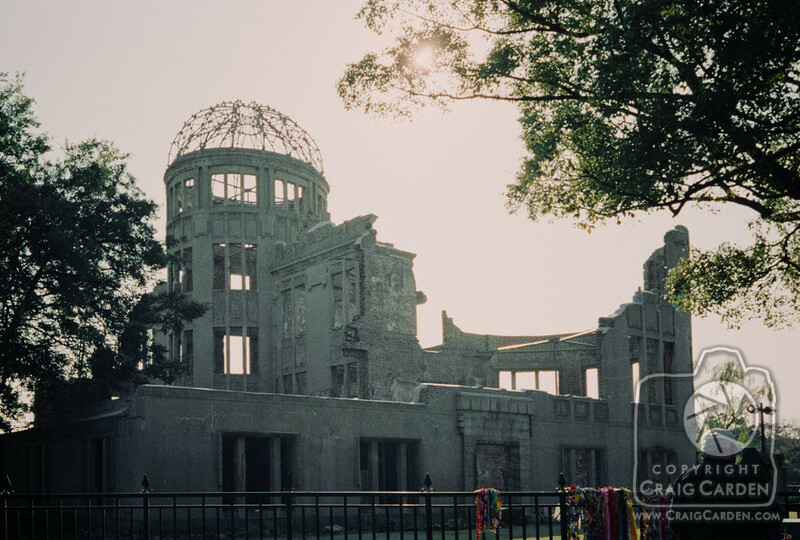 Built in alignment with the Dome and the Flame of Peace is the Memorial Cenotaph, containing lists of the names of all the victims of the atomic bombing of Hiroshima. These shots are interesting not only for the obvious subject matter, but for what you can't see in them: An elbow-to-elbow crowd of people. We were visiting on the day Emperor Akihito was being enthroned in Tokyo, and as such, the day had been declared a national holiday. All around us were families, visitors, and hundreds of students in their navy blue school uniforms. Even so, the second I raised my camera, the crowd would part in front of me like the proverbial Red Sea, without my even saying a word. Again and again, I was amazed at this mark of courtesy by the people of Hiroshima. Even if I'd wanted to have the whole crowd in the shot, I doubt I could have kept anyone in front of the lens. 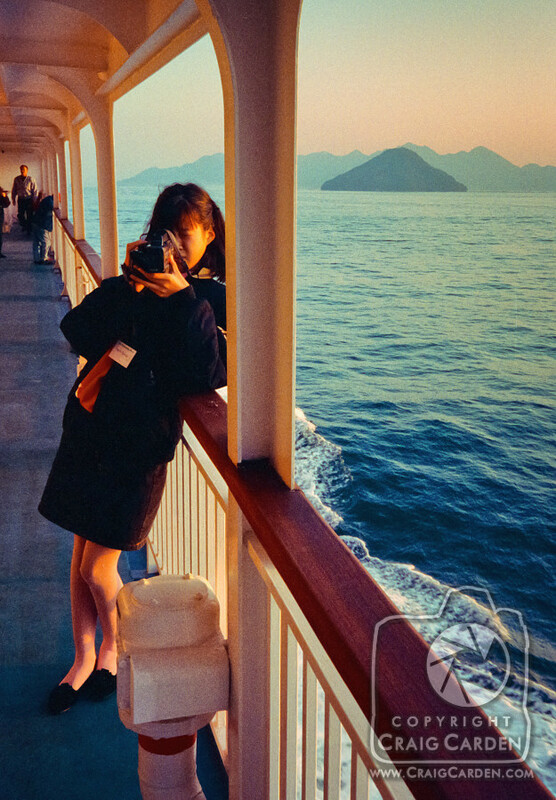 As the sun set over the Inland Sea, we boarded the ferry back to Matsuyama. Mrs. Matsuba's daughter Kumiko took over home video duties from her mother, and steadied her shots like a pro. Part of the trip from Matsuyama to Tokyo involved a nice long stretch on the 200-mph Shinkansen "bullet train" line. I didn't take very many pictures in Tokyo, since one city's suburbs, block apartments, and shopping malls look pretty much like those found anywhere else. 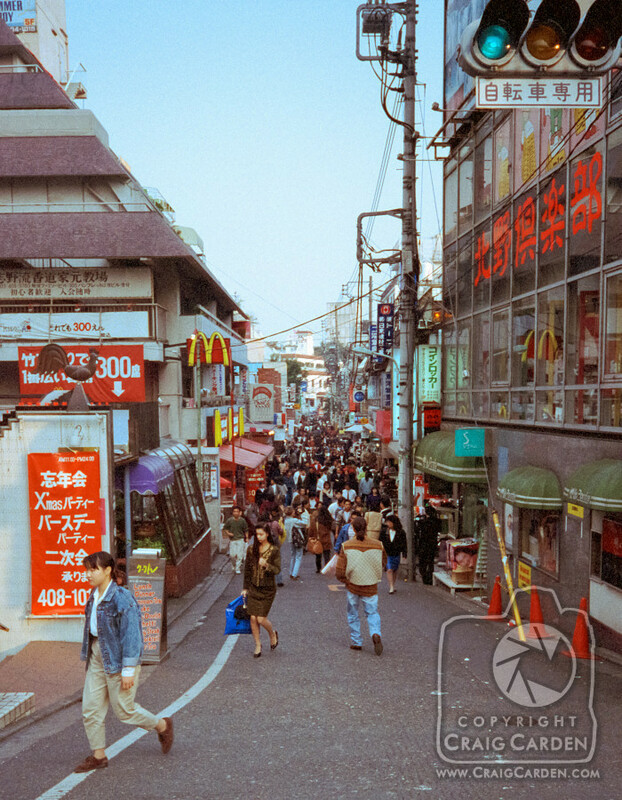 Still, even relatively modern Japanese institutions seem infused with their own built-in sense of tradition; The view from the top of ever-trendy Takeshita street is instantly recognizable to anyone who has been there. A weekend trip to Fujinomiya with our Tokyo hosts was beset by more low-hanging clouds. As we drove in a long, counterclockwise circuit around the mountain in search of any clear view of it we could find, I was struck by how similar the terrain and vegetation was to north Georgia. Looking out the side of the car that didn't have a 12,000-foot volcano looming in the window, I could easily have been on a small country road near my own house. Even the clear view of Fuji-san we eventually found had hallmarks of home: Long, low-slung buildings bearing more than a passing resemblance to chicken houses. Left with this as our only photo opportunity with the top of the mountain visible, I decided the weather gods in Japan must have quite a sense of humor. After a picnic lunch beside a small river, I took a few minutes to wander up and down the banks, continuing to enjoy the commonalities between the Fujinomiya area and the creeks and woods I'd wandered as a boy. Spotting a small path leading up into the woods, I did what I'd always done at the sight of trails in the woods, and followed it (Hansel and Gretel had no jurisdiction here). There didn't seem to be much to see at first, but then I spotted something unusual on one side of the trail: A small, rough stone marker, only a few inches high. Then further on, a tiny group of them clustered together. I noticed a bamboo tube with the remnants of incense sticks in front of one of the stones, but didn't dare to think this meant what it usually does. But soon I came to a much narrower path off to one side, leading deeper into the woods. Following the trail into a small clearing, I knew there could be no more doubt: There in the woods, with no signs or markers of any kind, was a small cemetery. The stones were grey with age, covered in moss and lichen. It didn't look as if anyone had been visiting recently. I silently wished the spirits well, and hoped they didn't mind my company for a few moments. Near Mt. Fuji is Shiraito Falls, a name that translates to "white strings," with good reason. The main falls are on the left, but all along a wide rock face spanning a distance of a hundred yards or more, myriad other tiny little waterfalls emerge. It was impossible for one photograph to capture it all, so decades before it became a standard feature of not-yet-invented digital cameras and phones, I stood in one spot and pivoted, mentally overlapping a series of pictures as I snapped away. For years, the only way I could show this scene to anyone was to lay out the prints, carefully match them up, and say, "Ok, there..."
Now, at long last, I've assembled a proper panoramic shot. (And yet there are those who lament the passing of the film era!) By the way, the color of the water is not a malfunction of the film or an embellishment; it really is that blue. Last but not least is another benefit of the digital age. The shot below was taken at the last moment as we headed to the car to leave Shiraito Falls. The limits of one-hour shopping mall photo processing back home meant that when I received my prints, all that was visible were the trees and the falls the developer must have figured were the subject of the shot. The area above the tree line was nothing but a faint haze of overcast. Between the return-trip jetlag, and sorting through several other rolls of film, I passed this one over without a thought. The print went back in the envelope, and was forgotten. Only after scanning the negatives and idly tweaking the sliders in Lightroom did the star of the top third of the frame suddenly reappear: Mt. Fuji, still in the negative, patiently waiting to emerge once more from the clouds. I very nearly jumped when I saw it. Nearly a quarter of a century later, the framing of that print finally made sense. Better still, I could now work with the digital image in layers, and get back what my eye had seen as we were leaving. It's no exaggeration to say that this picture has never been seen - and probably couldn't have been seen - until now.